You are invited to join with James B Beard aka Noodin as he speaks on topics such as traditional living and natural spirit teachings. His topics address many concerns to do with wellness and balance in life. He is a student of native teachings from Ojibwe Elders, Algonquin language based people, living throughout the Great Lakes Region of the US and Canada. The audiences for his presentations vary from youth to elderly. Jan 2018 – Present / Description: 2 1/2 hour program presenting songs, stories and prophecies. Focuses on community and self values as a way to create a better society, environment and understanding in a new time. A strong presentation for colleges and alternative educational sources and communities. The medicine wheel is a lifetime teacher’s aid. Correctly used it aids in committing to memory the oral teachings of people with a constant reference guide that is located everywhere. It is a tool for developing behavioral concepts. We all have animal helpers and we perceive them in many ways. To understand the animal that helps you requires an understanding of what needs to be fulfilled in your own life. The books tell us how some animals are meant to be understood. The true understanding is much more personal for each of us and may be completely different than what the books say. Then again, it could be right on. We live in a time of stress and chaos all around the world. Our lives are dramatically affected by a material driven society that has lost regard for the individual in favor of the governments and large corporations that guide our lives. There is a way to change all of that and our ancestors understood that. The Seven Prophesies are said to have been given to the people by Seven Spirits at the edge of the great salt water sea in the east approximately eleven hundred years ago. The story of the Seven Prophets is told by story teller Noodin with a following description of the Anishinaabe migration and fulfillment of the Prophesies into this time of the Seventh Prophesy. 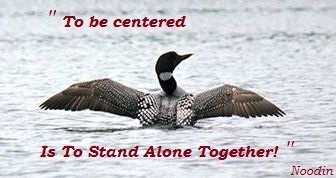 To create general awareness of environmental issues, their causes and solutions by bringing about changes in perception. A talking circle, is a method used by a group to discuss a topic in an egalitarian and non-confrontational manner or to simply "check-in" about what is present for them in their lives. Elders and story tellers begin with the story of creation - of all things. All stories told after the story of creation make up the whole history of the people. Stories of the people, in essence, give the people values to live by within societies. It is a part of the glue that holds a culture together. Demonstrations of drums, shakers and flutes used by the Northeast American Indian. Songs are played in Native American Languages with interpretation. Recordings of various tribal songs are included. The four basic spirit medicines of Northeastern Native Tribes are presented with an explanation of how they are used. Other medicines used for various ailments are also discussed. Many of the medicines used by Native American peoples are used by pharmaceutical companies today. Most Native American people make their own items including: clothing, jewelry, tools, and weapons. Crafting projects include beading, braiding, leather work, basket making, dream catchers, drums, shakers and flutes. We make pouches, moccasins, drums, shakers, cut pipe stone and dream catchers to name a few. We will put together workshops and coordinate them with our face book page, Moccasin Making Native Fabric or work one on one through private arrangements. In Memory of the Elder! 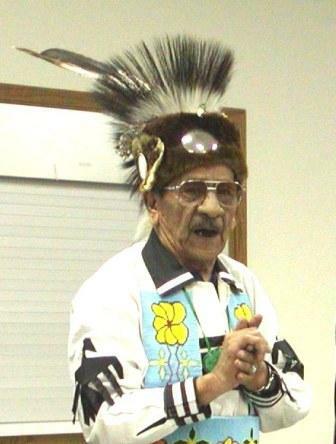 Elder Larry Matrious is of the Ahzhamook [cross roads] Band of Ojibwe. Born in the bush, there is no record of when, Larry was thought to be seventy six years in age. He was taught in the ways of his father and grandfather and practiced his tradition in the old ways using the old Ojibwe language. He was one of the last elders of the old way at Lake Lena Reservation, Minnesota. In 1989 Larry came to New Hampshire to lead a gathering of people learning to walk the spirit path. He stayed here to teach for much of the time over a period of five years. 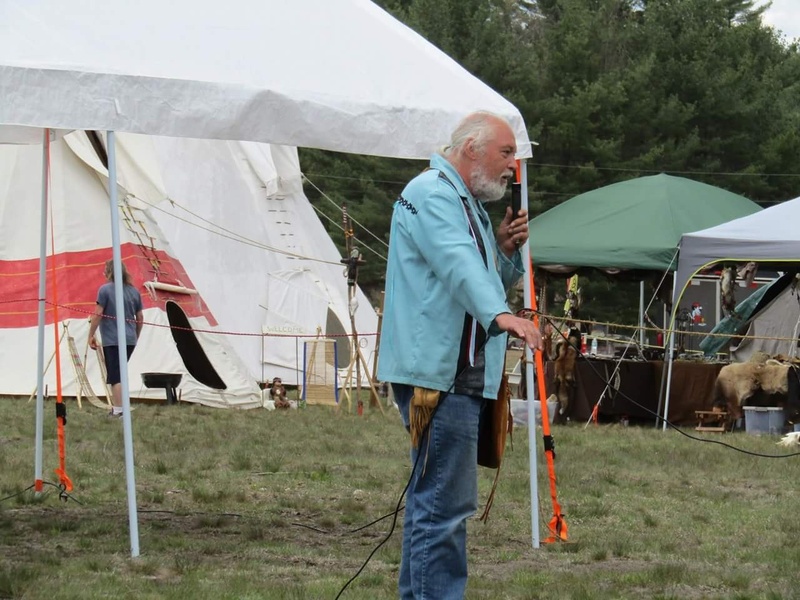 His gatherings are well known and people came from all over New England to learn from him. Many people today live the traditional way of life as they were given instruction under this elder. It is now the responsibility of those of us that have been given teachings by Larry to continue to share that knowledge and legacy. Larry is a recognized elder and healer of the Ojibwe. He was, and in spirit is, a member of the Midewiwin Medicine Society of the Ojibwe.